F.A. Wilhelm Construction Company Newsletter for November 2013. Imagine you’ve suddenly been put in charge of a construction site for multi-use space with all the big equipment: cranes, trucks, bulldozers, etc. and materials needing be brought in and all the waste to be taken out. Now imagine you only have 18 feet by 100 feet, approximately the equivalent to one lane of traffic, to work with. It begins to look much more challenging! This is how much space Wilhelm Superintendent Bob Shackelford had to work with when he mobilized to the job site at Bankier Apartments in Champaign, Ill.
Wilhelm leased a small property close by to help store materials. Shackelford and the onsite operator do a lot of ferrying from that site to the job site. Wilhelm used special equipment, including a self-climbing placing boom, which allows the team to use a much smaller concrete pump at ground level. They also erected a self-climbing forming system for the stair and elevator cores of the building. This system forms and wrecks at the point of placement, and it “jumps” itself to the next lift, which eliminates the need to remove forms and then stage for use. Wilhelm’s work on Bankier Apartments involves three levels of parking, a ground level commercial space as well as ten levels of residential and ‘open’ space. Wilhelm is self-performing the concrete structure and miscellaneous metals portion. Wilhelm served as concrete contractor on another tight site at 720 Northwestern Avenue, a multi-use building with two levels of underground parking, a commercial tenant level, and four levels of residential apartments in West Lafayette, Ind. The structure was built in two sections due to the restrictions of the building’s footprint. Scott Marvel, Wilhelm’s superintendent on this project faced challenges on pour days coordinating lane closures as well as securing space for Wilhelm concrete trucks. The concrete pump truck was confined to 20 feet for setting up, so placement and coordination with other trades was critical to prevent problems with the pump truck. Stu Johnson served as the superintendent for a public parking garage in downtown Columbus, Ind. completed in 2009. Wilhelm served as general contractor for this restricted site, which was right up against the sidewalk on city blocks. Johnson said the site wasn’t necessarily small; there was just no buffer past the job site. The logistics were sometimes tough to keep up with, but he credits his success to the assistance from Wilhelm. “The support the company gives the field is the real answer,” Johnson said. Mark Kocher, Wilhelm superintendent, has also worked within site restraints when he managed an addition to the Chemical Engineering building on Purdue University’s campus from 2003 to 2004. The buildings and student walk paths had to remain open, accessible, and safe all throughout the project. These butted right up against the work site. Narrowed sites like this where access is limited, there is a heightened need for creativity and precise planning. “The first time I looked at that job, I thought, ‘how in the world are we going to manage that?’” Kocher said, especially concerned for the safety of the public. To manage all the chaos within a tiny space, and to keep it safe, Kocher created a logistics and delivery board inside his office. Any deliveries had to be on the board, no matter how big or small, to prevent bottle necking. If it wasn’t on the board, it didn’t get delivered. Wilhelm’s success in these restricted project locations is attributed to the problem-solving expertise of the field staff and our dedication to safety for everyone involved. This problem-solving and support are what allows Wilhelm to work successfully in otherwise cramped sites, according to Tague. Students and faculty at Purdue University have much to look forward to when F.A. 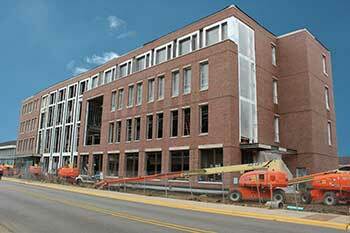 Wilhelm Construction completes work on the Center for Student Excellence and Leadership (CSEL) in March 2014. Wilhelm is serving as general contractor on this $20 million, 67,000-square-foot facility, which is part of Purdue’s “New Synergies” strategic plan. This center has been in the works since 2009, dreamt up by a committee consisting of staff and students. Wilhelm is helping make it a reality. The Center is located on Vawter Field and will serve as the focal point of the proposed Student Success Corridor along Third Street. The Center will be a type of community building, open at all hours of the day. It will consist of four stories including extra meeting spaces for students, both for studying and gathering as well as for student organizations to meet rent-free. The exterior is primarily brick, curtain wall, windows, and composite stone panels. While interior materials will be conventional, the first level will feature terrazzo flooring. Justin Lawhorn, Wilhelm project engineer, said the most unique feature of the building will be a monumental staircase open from first level to fourth level and will create a sort of atrium area. The staircase will have glass guardrails and a lighted LED handrail. A building as beautiful and functional as this is not without its challenges, Lawhorn acknowledges. In addition to these impressive features, the University is seeking no less than a LEED Silver rating for the CSEL project. Some steps Wilhelm has taken to help accomplish this using recycled content, regional materials, and Forest Stewardship Council-certified wood in constructing the building. Construction Waste Management was also followed to satisfy LEED guidelines, and low-emitting materials were used to improve the indoor environmental quality. Wilhelm has completed the steel structure, concrete slab on a metal deck, and exterior framing. In the next few months, Wilhelm will begin to complete the masonry, curtain wall, and windows as well as installing composite stone panels. The wall framing is nearly complete, while the mechanical, electrical, and plumbing are still in progress. View more images of the drafted interior of the Center for Student Excellence and Leadership from the designer, SASAKI. "Twenty years -- my how time flies when you are working at Wilhelm! Through the years I have been able to travel throughout Indiana and Illinois and work with some great people. One phrase I recall when I started in the facilities group was “small jobs turn big at Wilhelm.” That phrase is so true; owners don’t call Wilhelm if it is an easy job, they understand our commitment to getting their job done safely, within budget, and on time. One client made me a believer when they called for us to perform a few small projects. The following year, I had the opportunity to help build a new test facility, something they had not attempted in 30 years. 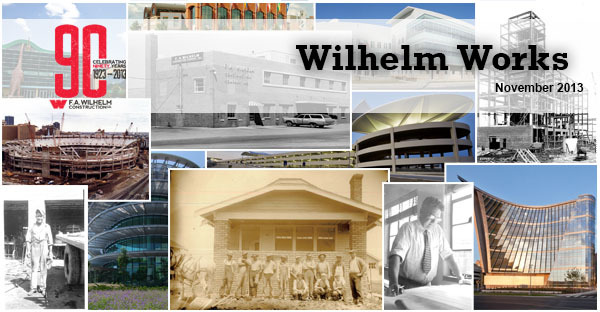 My family would like to say congratulations Wilhelm on 90 years of success and letting us be part of it for the last twenty." F.A. Wilhelm Construction Company is self-performing concrete and masonry for The Depot at Nickel Plate, a mixed-use development in Fishers, Ind. and has been awarded a general construction contract with General Electric for construction of a control building and a test building. Poynter is lining up school work for 2014 with the addition of a new school in Paris, Ill. as well as renovations to Noblesville (Indiana) schools. 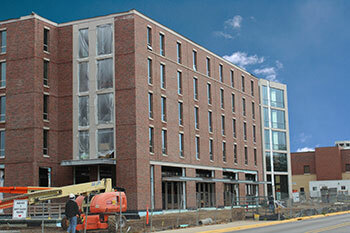 Slated for completion in June 2014, this dorm will sleep more than 300 students. It sits on Purdue University's campus Vawter Field between Wiley Dining Court and Third Street. Wilhelm Construction is serving as general contractor on the new Vawter Field Housing, a $28 million, five-story, 101,000-square-foot structure. Levels two through five will include 19 student suites each. The first level will have a staff and a faculty apartment including kitchen and living spaces. In addition to student success space, laundry room, mailroom, lounge and in-house kitchen and seating. The idea of this particular hall will be to attract upperclassmen to live with other students pursuing similar academic studies. Zach Wiles, Wilhelm project engineer, said one unique feature of this project is the cast-in-place structure, which used post tension cables in the upper floor slabs to reduce the use of conventional reinforcing. He added there are exposed concrete ceiling and columns throughout the building. The columns and ceilings in the student suites will receive an acrylic, textured finish. While Wilhelm has done its share of residence halls, Wiles said precision and scrutiny played a large part in this project. The exterior of the building is primarily brick, curtain wall, windows and composite stone panels, with the interior consisting of metal stud framing, drywall, hollow metal door frames and primarily wood doors. The University is seeking no less than a LEED Silver rating for Vawter Field Housing. The project is scheduled for completion in June 2014. View more images of the drafted interior of Vawter Field Housing from the designer, SASAKI. Wilhelm is a busy with constant deadlines, completing projects, and managing complicated construction phases through all seasons of the year. But Wilhelm is also a company that takes the time to give, and that was clear through their recent campaign benefiting United Way. Wilhelm has conducted this annual campaign for more than ten years, giving employees both in the office and in the field a chance to contribute to the cause. The 2013 campaign raised an impressive $14,472 from employees; Wilhelm matched these contributions, bringing the total donation to $28,944. According to Brooke Lock, Wilhelm’s marketing coordinator, affiliate companies were also invited to contribute. Contributions are distributed by zip code, allowing employees to give in their own community. The campaign included a kick-off meeting featuring United Way Loaned Executive Janelle Groce and Torchbearer Jenny Atkinson. Groce, an executive with FedEx, is loaned to United Way for a short period of time to help staff corporate fundraising campaigns. Atkinson is the Equine Program Manager for Children’s TherAplay Foundation a not-for-profit outpatient rehabilitation clinic and United Way agency. Atkinson said companies like Wilhelm that take the time to invest in United Way provide precious support to organizations like Children’s TherAplay. They provide special needs children a foundation for developing life skills through innovative therapy, including equine assisted physical and occupational therapy. 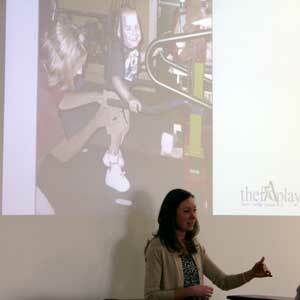 At the kick-off, Atkinson shared about a three-year old boy, Tim, with Downs Syndrome who had been receiving therapy at TherAplay for about a year. He had a tracheotomy tube planted at the base of his neck to help him breathe. His breath made a wheezing sound and his diaphragm was not strong enough to allow him to speak. One day last winter after one of his sessions, Tim said, “bye-bye,” shocking the therapists. The therapy he had received at atop a horse had allowed him to build the strength to speak. It’s stories like this that keep Atkinson loving her job and deeply appreciating support from companies like Wilhelm. Groce also stressed the importance of Wilhelm’s interest and support in United Way. Copyright © 2013 F.A. Wilhelm Construction Company, All rights reserved.